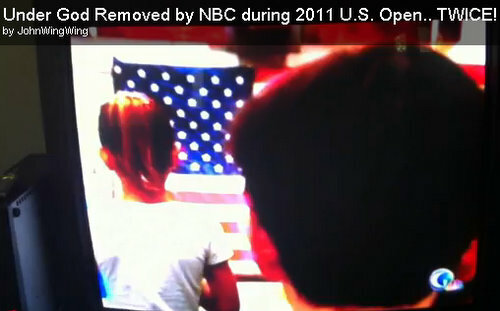 During NBC’s coverage of the U.S. Open golf tournament, a video was played that featured the reciting of The United States Pledge of Allegiance. Ironically, during the video segment, “Under God” was omitted twice – and during the second omission, the phrase “one nation” was also omitted. This instantly caught the attention of the Twittersphere where rage, discussion, and commentary erupted. I would really, really, like the person who edited out the “Under God” part, and the person who ordered it edited out to step forward and identify themselves to America, Fat chance. These weasels will stay in their cowardly holes forever.